stepping out in faith: Thank you, God, for those who give care to the elderly. Thank you, God, for those who give care to the elderly. Our world worships power and money. People who work in politics and those who tend to financial matters have jobs that earn them respect and high salaries. The workers we pay the least and seemingly dismiss, are those who care for our children, for our disabled and our elderly. In these jobs, the pay is low, and the workers must grow thick skin as they find themselves victims of the frustrations of others. They are rarely honored and rarely thanked for the tireless and quiet work they accomplish each day. The world gives a strong message about what is important, but the world has it wrong. Nothing is more important than guiding a lost grandfather to the dining room. Nothing is more important than calming a grandmother who still does not see her home as a familiar place. Nothing is more important than checking on a father who has fallen or taking care of the soiled briefs of a mother. Nothing is more important than lovingly arranging the day’s meal on the plate or carefully cleaning the bathroom. Nothing is more important than celebrating a birthday with bingo or greeting a family member at the door. Nothing is more important than getting medicine to the right person, clean teeth to the right mouth, or the clean clothes to the right closet. Nothing is more important than patiently answering the same question as many times as it is asked. Nothing is more important than tenderly moving a dying body that can no longer move itself. Nothing is more important than assisting someone with her last bath, her last meal, her last time to dress. Nothing is more important than offering food or comfort to family members waiting by the bedside of a loved one. 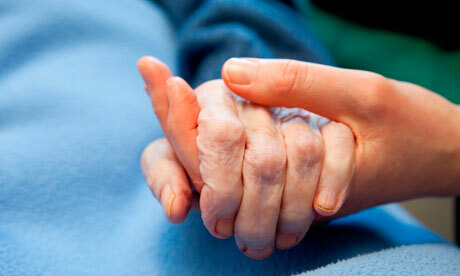 Nothing is more important than explanations gently offered for the signs of the end of life. Nothing is more important than the phone call no family member wants to receive and no caregiver wants to make. Nothing is more important than the tears you shed behind closed doors when you lose yet another friend who found a place in your heart. For those of you who are caregivers for our precious loved ones, the only thing more important than what you do, is what God has done for you. Having worked in a nursing home I can agree. I've worked with some of the most dedicated unsung heros in the world. God bless, Kim for this beautifully written piece. Once again you have touched my heart with your beautiful words. I have tears in my eyes after reading this poignant post. Not only is it true, it brings back tender memories of those who cared for David and my dad. Thank you for putting into words what I feel in my heart.